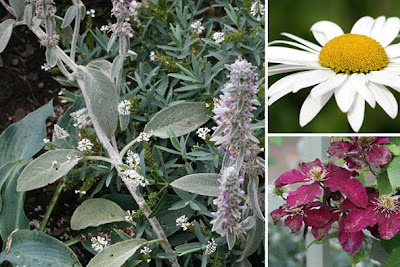 August is an interesting time in the garden for both flower and foliage. 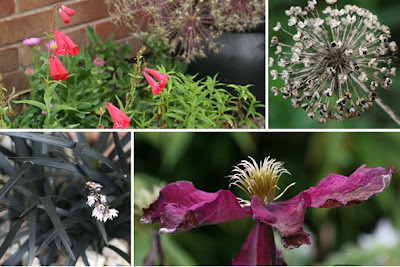 Last Friday (the 15th of the month) saw Garden Bloggers Bloom Day time once again. I thoroughly enjoy joining in with Carol and many other garden Bloggers to post on what is in flower in my garden on that date. Although I don’t always post on the fifteenth I always take my photos or videos then. Last month I only posted photos but this month I have loads to chat about! So what are my garden impressions for August 2008? Well, perhaps the very first photo of my first montage below gives you a clue. Yep… August in my garden has seen lots of insects visit my plants. I am particularly delighted to see so many bees this year especially when there are worries about their declining numbers. The drumstick allium sphaerocephalon shown in the first two photos have been very popular with the bees and me! These were quite inexpensive bulbs as I bought them last year in garden centre sales at the end of the season. It was perhaps past the ideal planting time for them in the garden but I planted them up in pond baskets and sunk them into the ground. I only planted them in baskets so I wouldn’t disturb the clumps as I often move my plants around and forget where the bulbs are. 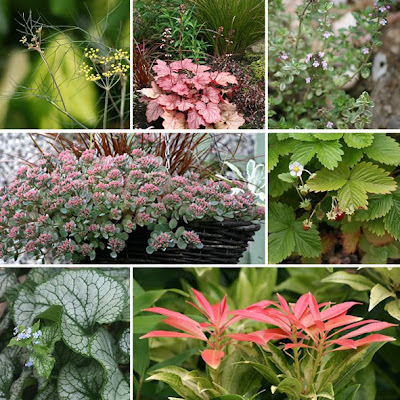 The photo on the right of the second row above shows some flowers from one basket clump which are darker in colour as this is a more shady area. I had hoped they would grow more upright but they have grown to the side looking for light and some flowers are completely hidden. The next dry day I plan to lift the basket and replant the whole clump directly into the ground in another part of the garden where others are already growing. Good sized plantings of the same plant work well in my small borders. The hosta flower in the centre photo is another that attracts the bees and although I really grow this plant more for its foliage it is great to see that once again it suits both wildlife and me! As I have a small garden I sometimes like to experiment with bold colour in my predominately green garden. The deep orange red of the candelabra primula ‘Inverewe’ I have really enjoyed but was really quite surprised to see it flowering in August. I was even more surprised to see not one but two different hellebores with single flowers – this is a spring flowering plant! 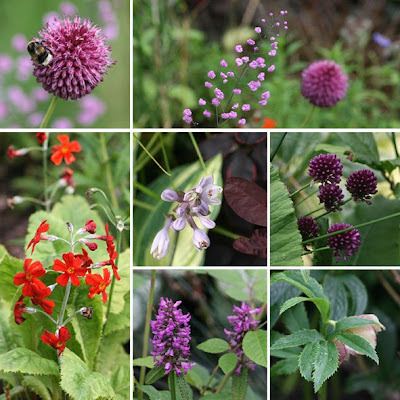 The other plants in the montage above include the wonderful tiny purple flowers of a Thalictrum delavaya 'Hewwitt's Double' and the small purple flower spires of Stachys monnieri 'Hummelo' from a Piet Oudolf collection. Green was the colour for Chelsea 2008 but I had chosen to add darker deep burgundy colours to my garden this year. I think they look great with the greens. I have adored the dark penstemon growing in my front garden! This is a new addition and I definitely plan to take cuttings of this plant to increase it for next year. Penstemons are great for late colour in the garden and do keep the bees supplied with food at a time when it is in short supply. I had penstemon ‘etna’ in flower all the way through to December and into January last year. Foliage colour is also something I always look for and this year two heucheras caught my eye. Heuchera ‘licorice’ shown above is looking great in my front garden growing alongside the penstemons and I always find it surprising that its tiny flowers also attract the bees! Kein fontaine is an ornamental grass that is coming nicely into flower in my front garden. I planted this one a few years ago and as you can see in the first photo of the bottom row above it has a burgundy colour too. This year I actually managed to successfully grow some sweet peas directly into the ground (another surprise) and the variety ‘Cupani’ as you can see had the deep colour I was looking for too. I've been pleased with them. I'm not sure if the bees are interested in them. 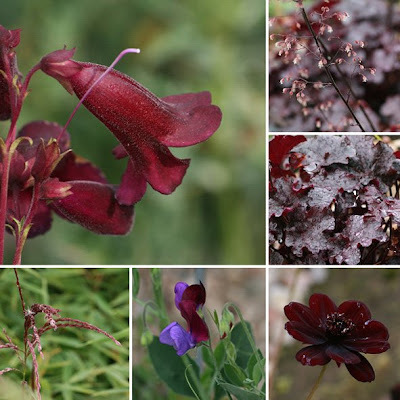 Mm… but if there is one strong favourite for my new colour theme it has to be the Chocolate Cosmos astrosanguineus shown in the last photo. What a fantastic almost velvet looking flower it is! This plant is also new to my garden for 2008 so we shall have to see how it over winters. I have read that a deep mulch might help but mine are planted in gravel. I may consider lifting one and over winter it in my greenhouse. I could then try and take cuttings in the spring if the others don’t survive. Penstemon ‘Etna’ shown above with its deep coral red tubular flowers I planted in my garden three years ago. I took cuttings that year and a staggering 54 rooted - I allowed for losses! It has had a long flowering season still giving flowers up to December and an odd one into January too. I have admired it and the bees have just loved it! This plant has been dotted all around my garden and has gone to family and friends too! I really hope the new dark one is successful with cuttings too - I must find the label but I think this one is the variety 'Raven'. You can see that my pink aster is in flower too and that the Allium ‘Christophii’ is going to seed now. Black seeds are already visible on Allium ‘Purple sensation’ and I should cut these seed heads down soon and put them in paper bags to dry out and collect the seeds. The black grass Ophiopogon planiscapus ‘Nigrescens’ is also in flower now. I added a few plants of this to my front garden this year to tone in the new deep burgundy reds. It also blends well with my dark charcoal grey pots and blue grey pebbles. The black does good in the sun. Last year I added the clematis ‘Picardi’ to my front garden and it is probably the driver in my thoughts to add more of this deep colour this year. It looked great amongst the bamboo, borage and grasses and has flowered well this year. I really should pay more attention to dead heading it though - note to self for next year!! Sorry… I am making up for the lack of chat last month! This next montage shows the variety of foliage shape and colour as well as flower. The first row starts with the tiny yellow flowers forming on the feathery foliage stems of bronze fennel. This is followed by my second new heuchera introduction for 2008 ‘Georgia Peach’ which is also in flower now - it looks great with the dark leaves of the grass uncinia ‘rubra’. ‘Silver Queen’ thyme is also in flower now and I am sure insects are visiting this plant too. Sedum ‘Rose Carpet’ has been a great success in the hanging basket at my back door arch. I have been looking out for more of this plant all year. Finally, at the weekend I was delighted to plant up another three baskets with it to hang in my front garden. I hope that the bees or butterflies will discover them there. The tiny white flowers of my alpine strawberries always make me smile and the tiny blue ones of the Brunnera ‘Jack Frost’ always make me take a second look! I love the leaves of this plant and the flowers are like the icing on the cake. The red bracts of new growth on my Pieris were a surprise when I took my photos – another I associate with spring. Mm... that's a few plants flowering or behaving out of season now. Back we go to the bees again for this next montage above. 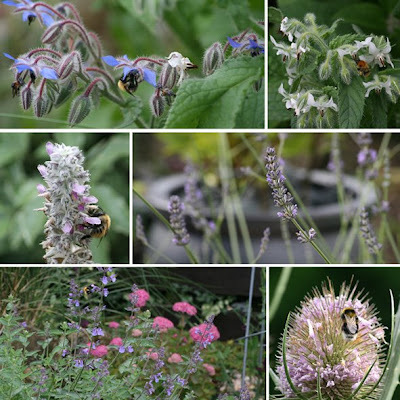 It would be a tossed coin to decide between Nepata (catmint) or borage for the top flowers for the bees in my garden. Blue or white flowers the borage is just buzzing with bees! Nepata ‘walkers low’ is in its second flush of flowers after I cut it completely back after its first flowering in the middle of July. It always amazes me how quickly it re-grows at this time of year and can be seen with another 'plant sale' plant from last season sedum ‘carl’. I am looking forward to seeing the butterflies visit ‘carl’ soon. This wet weather we’ve been having is not helping the butterflies visit although I have seen a few small tortoiseshells this year so far. The stalky spires of lamb’s ears Stachys byzantina and the delicate spires of lavender are also popular with the bees and hover flies too. However, the big surprise for bees and other insects have been the spiky teasel flowers. I have grown this plant with only one purpose this year – to take photos of goldfinches feeding at it! Sad but true. I have never grown this plant before and had no idea how tall it would get or that so many insects would be interested in its flowers! This next montage is dedicated to the butterflies, old and new, that visit my garden. Verbena Bonariensis leads the field for butterflies in my garden towering above all other flowers at the moment. These plants over wintered okay in the ground but I will take cuttings to ensure I have new plants should we get a hard winter ahead. It has just come into flower where Buddleja (the butterfly bush) is almost finished flowering. Stipa gigantea (the giant oat grass) is now flowering well now too and I have noticed the butterflies do rest a moment on their way to the flowers in this area of my front garden. My sunnier front garden is the best place to see the visiting butterflies. Sedum ‘Carl (centre photo, bottom row) is now showing its wonderful pink heads of tiny flowers. I cannot believe how well this plant is looking now compared with how I found it in the garden centre sale quite dead looking last year. I love to save plants like this. I recognised the variety as being a good one and with it only being £2 it was well worth taking home! I am sure the butterflies will think so too. Cone flowers are also a new addition to my garden for this year. The pink and white ones (on either side of ‘Carl’) were bought on holiday in Norfolk this year after seeing butterflies visit them on the staging at the garden centre! I think they will be happy in my front garden and I plan to look into how I can propagate from them soon. I have mislaid a bag of labels so I can’t name my cone flowers for the moment but will update this post when I find them. My partially shaded back garden holds completely different favourite flowers for me and top of the list here is the Japanese Anemone. The first flowers were budding for my July Bloom day post and opened about ten days after. Not only are the flowers early this year but my original plant is budding with more flowers than I have ever seen on it. 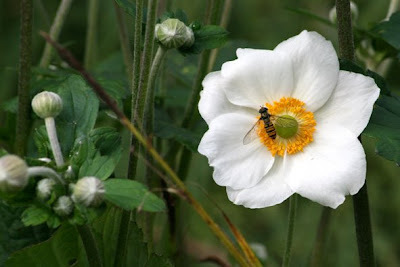 It must be a good year for Japanese Anemones! The insects love this plant too. 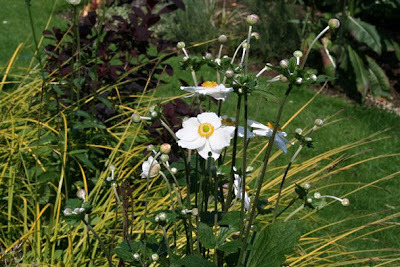 White flowers aren’t always popular with gardeners when they go brown and look marked and worn. I expect that perhaps mine fair fresher a little longer as they don’t get too much sun on them. You can also see the Shasta daisy looking fresh at the moment too in the montage below – another popular flower for insects although they don’t last as long as the anemone. My small silver border started well last year and had loads of promise but the Stachys byzantina in flower is falling all over the smaller compact hebe and hosta and now none are seen to their best. It doesn’t look natural – just messy. So it’s time for it to move to another spot where it can do its own thing. Mm… there's a problem there. Where have I room for it? Clematis 'Niobe' is passing its best now but I think I will try taking cuttings from it this year as it has such a wonderful deep colour especially when planted in partial shade. I enjoy the challenge of cuttings. This time of year that I tend to get out my propagation books to see what plants I can take cuttings from. 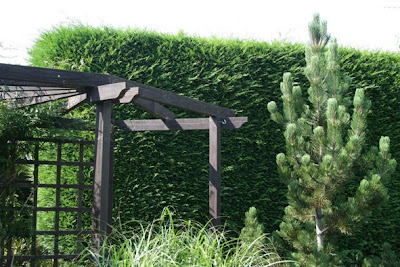 August is the month for cutting the largest planting in my garden – our Leylandii hedge! Not at all a job I look forward to but it really does need to be kept under control. We didn't plant this hedge and it was already mature when we moved here. You can see in the first photo above the new growth that will be trimmed away. Before and after photos below show our first section completed – we worked on this last Saturday. We will now need to wait until this weekend and hope it stays dry at least part of the time. 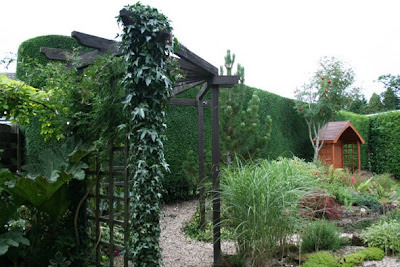 This is the shorter of the two lengths of hedge we have! Ivy growing up my walkway also got a trim and this will promote thicker growth. Oh.. the jasmine growing beside the ivy was growing up and out of my walkway and I would never see or be able to smell its wonderful white scented flowers. I pulled stems through the trellis and under the top supports and what a difference that made. I hadn’t realised it was flowering! I also spotted some red campion (pink flowers) in this more natural area growing up through the gunnera leaves. Between these and the hosta flowers this would be another popular area with insects. 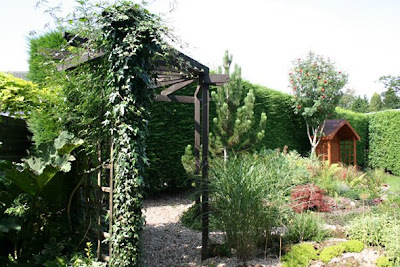 This is a post on flowering plants so why have I shown photos of a hedge being trimmed? Well, once trimmed the hedge is darker in colour and it recedes into the background. It then acts as a wonderful living backdrop for flowering plants to shine out! 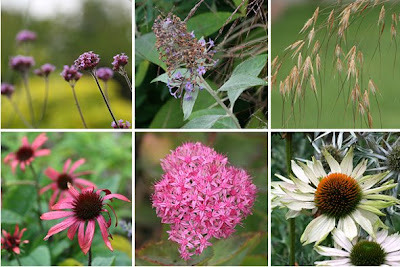 Yep… there are lots going on in garden during August – it is an interesting month. All photos above were taken in my garden on August 15th 2008 escept for the hedge ones which were taken on August 16th 2008. Gorgeous Blooms Shirl! I love the variety of plants you have blooming in your garden right now. I love Alliums, one of my favorite bulbs! What a great contribution to GBBD Shirl! Don't remind me, we still have to cut our hedge, miles of it! Oh nooooooooo! In my garden the bees are nuts about the borage too, the white one in particular. About the choc cosmos: best lift it and put it somewhere frost proof over winter. I do that too because it doesn't even survive the mild winters in my country let alone the more harsh ones in your. It's fun to see that we have many plants (and even a girnormous hedge ) in common! What a beautiful and informative post! Very much worth the wait. Thanks for joining in for bloom day. I love the colors of your garden. There's just something special about those deep burgundy tones which add such depth. I wonder what's up with the Anemones blooming so early this year for you. They always say "autumn" to me, even though they start blooming in August around here (usually). I'm glad you caught your reblooming Hellebore in time for your Bloom Day post. I wish I had found mine in time too. A very interesting post, Shirl! And I saw some plants we have in common. My black grass from Scotland is doing well, but its flowers have already faded weeks ago. I'm not very successful with my white anemones japonica, they disappear a short time after planting (reason unknown), but the pink sorts are almost invasive. Never mind, I like their flowers, especially at this time of the year. My dark colour plants are mostly heucheras which are doing quite well.